The Wellington representative team to play against Hawke's Bay for the Haines Cup is: Steve Frampton (Hatiatia), Yvonne Futcher (Wanganui East), Dave Gatchell (Horowhenua), Lew Gill (Horowhenua), Annick Le Guen (Kapiti), Shirley MacDonald (Otaki), Sheryl Parslow (Wanganui East), Shirley Selwyn (Wanganui East), Christine Strichen (Wanganui East), Claire Wilson (Masterton). On 25 November Kapiti Pétanque club held the over 70’s Mêlée. A field of 32 players from clubs around the region took part in this annual event. Despite some early drizzle, the weather stayed fine. The format was the usual mêlée format of 5 games with different partners and opposition. As on any interclub day, the camaraderie was evident. There was a load of laughter, good natured ribbing and a great catch up with players who have known each other through various competitions over a long period of time. Over the course of the day, there were a couple of players who thought they needed extra help. Not just content to kneel down, one of them felt he had to prostrate himself. Strange happenings indeed. Needless to say, the extra homage failed to assist them in their quest. The annual match between Canterbury, Southern and Wellington was held in Otaki. As hosts Wellington fielded two teams. However, Canterbury decided not to attend this year and so Wellington fielded a development team as a replacement. The three rounds of Singles matches were replaced by Doubles due to mutual agreement. Twenty-six teams have entered the National Senior Doubles Championship at Kapiti this weekend (5-6 December). Twenty teams entered the Guy Fawkes Doubles at Horowhenua. Prizes were $100 first and $50 runner up. Levin turned on perfect sunshine and the day was a social occasion for all. This is the fourth year this event has been held, but this year women were included rather than the all male event of the first three years. Winners were Sheryl Parslow and Sue Gurr from Wanganui East. 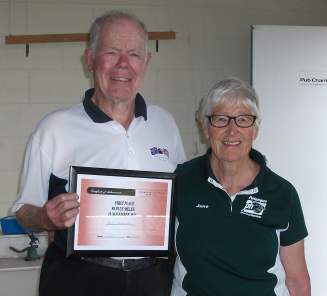 Runners up were Lew Gill (Horowhenua) and Shirley Selwyn (Wanganui). Third place went to Ian Bailey and Don Thompson from Manawatu. There were 16 entries in the Horowhenua 80 plus Mêlée this year. There were four games played and a random draw for partners. A delicious lunch was served to participants after the second game. The overall winner for the day was Brian Bradburn (Silverstream). Second place went to Shirley Peard (Horowhenua), third place went to Jean Baine (Upper Hutt). The placegetters were awarded a framed certificate. 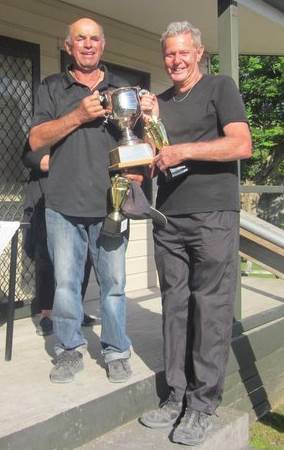 Bill Peachey and Ray Pierce bounced back from their poor showing at the National Doubles last month to take out the National Senior Doubles at Kapiti. In the Trophy final they beat Ian Baker and Bob Bridge. The Trophy Consolation was won by Dave Gatchell and Enoka Smiler and the Consolante was by Karen Stephen and Chris Taylor. Fifteen teams have entered the Wellington Open Triples at Manawatu this Saturday (12 December). The Hawke's Bay team to play against Wellington in the annual Haines Cup match is: Maurice Belz, Sharon Cannon, Ian Hay, Robin Johnston, John Maxwell, Gordon Ogden, Murray Porter, Bethne Rouse, Lee Taffard and Robert Wilson. The match will be played at the Manawatu Pétanque club (74 North Street, Palmerston North) on Sunday, 13 December starting at 10:00 am. Wellington last won the Haines Cup in 2010. Hawke's Bay lead 6-5, with one match drawn. Previous results. The draft minutes from the WPA Committee meeting held on 19 November are now available. 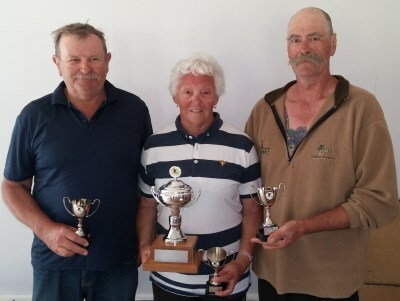 Two teams were undefeated after the four qualifying rounds at the Wellington Open Triples at the Manawatu Pétanque club: Grant Bray/Michael Rocks/Peter van Heusden and Sharon Cannon/Murray Porter/Brian Smith. However, it was the third placed Dave Gatchell/Lew Gill/Shirley Selwyn who went through the knockout rounds undefeated to claim the Open Triples title. Steve Frampton/Ann Hogg/Graeme Morris won the Plate from Shirley MacDonald/Enoka Smiler/Monica Smiler. The Bowl was won by Pete Hamilton/Barb Johnston/Joan Miller against Alan Cameron/David Smart/Willie Tipene. Ian Bailey/Christine Daykin/Judith Smith took out the Bowl Consolation from Derek Cooper/Elva Cooper/Paul Husband. Wellington has regained the Wellington-Hawkes Bay Challenge Cup (formerly the Haines Cup) with a narrow 21-19 victory which went right down to the last game of Triples. Wellington won the first round of Singles, 6 games to 4 to take the early lead. The second round was Doubles and Hawke's Bay won 3 games to 2, to draw level on points at 10-10. With 10 player teams, round three featured three games of Triples and one game of Singles. Wellington won the Singles and one Triples. Hawke's Bay took the lead 16-14. Round four was the same format as round three with the exception that the payers that played Singles in round three had to go into a Triples combination for round four. Wellington needed to win the Singles and two of the three Triples to take the trophy. They won the Singles and one Triples and lost a Triples with one Triples game still being played. The last Triples game to finish was a nail biter with Wellington coming out on top 13-9. This has broken the Hawke's Bay dominance of the last four years. The video of Wellington Open Triples final is now on the Wellington Pétanque YouTube channel. Harold Dercy, Pascal Dufroux, Clifford Edouard, Sebastian Edouard, Vickram Khadaroo, Vickram Ramjuttun. Anastasea Darbinian, Sasha Darbinian, Adeline Deramond, Lynn Dufresne, Bridie Kinghorn, Kate Mangan. The Coach is Patrick Dufresne. Max Chaperon, Danny Green, Walter Lubtschenko, Charles Jodin, John Rowe, Gilbert Tourneur. Maria Louise Fuentes, Medgee Lebrasse, Shirley Marshall, Margaret McCormick, Monique Tourneur, Judy Whiteaker. The Coach is Lindsay Kinghorn. Lisa Deramond and Lindsay Kinghorn are the Reserve players. Six Wellington players have been selected for the New Zealand Senior team to play against Australia. The annual Trans-Tasman match will be held in Alexandra (19-20 March 2016). Neville Frost (Dunedin City), Lewis Gill (Horowhenua), Pete Hamilton (Wanganui East), Graeme Morris (Masterton), Bill Peachey (Hibiscus Coast), Ray Pierce (Herne Bay). The Reserve is Mervyn Wilson (St. Kilda) and the Coach is Murray Porter (Bay View). Claire Bradburn (Silverstream), Marilyn Bunce (Alexandra), Kay George (St.Kilda), Shirley MacDonald (Otaki), Margaret Maher (Northcote), Sheryl Parslow (Wanganui East). The Reserve is Ann Shields (Epsom) and the Coach is Jean Parley (Stanley Bay). Lew and Sheryl will be making their international debut.